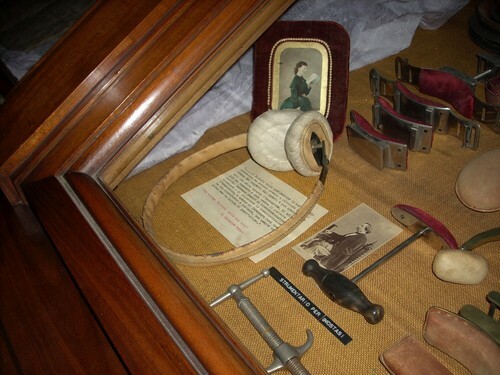 Among many others surgical instruments belonged to Francesco Rizzoli, a pair of earmuffs the surgeon used during some operations can be seen in the glass cases of the third room of The "Umberto I" Library in the Istituto Ortopedico Rizzoli, Bologna. Rizzoli belonged to that generation of surgeons still hesitating between a complete anaesthesia and the possibility for the surgeon to be driven by the groans and the screams of pain of the patient. Photo by Luca Borghi ti.supmacinu|ihgrob.l#| (April 2009), courtesy of Istituto Ortopedico Rizzoli and Fondazione Carisbo.